A 71-year-old female nonsmoking patient is admitted to our hospital for evaluation of a pulmonary mass of the left upper lobe. She presents with slight persistent cough for the past 3 months. A routine laboratory study at the family practitioner shows an increase of (carcinoembryonic antigen) CEA rising within one year from 2,9 ng/ml to 14,8 ng/ml, prompting further radiological investigation. Her past medical history is significant for a curative resection of stage III colorectal cancer (CRC) in 1990, 25 years earlier. Physical examination is not contributive. Blood tests reveal slightly increased liver enzymes (ASAT 54 U/l, ALAT 46 U/l) but are otherwise unremarkable. Pulmonary function tests are normal. A thoracic computed tomography is shown in figure 1. On the abdominal CT liver, spleen and pancreas appear regular, uniform without focal lesions, and there is no evidence of thickening or abnormal lesion in the digestive tract. The 18F-FDG positron emission tomography (PET) study (Figure 2) shows increased left pulmonary intense uptake in the left upper lobe mass, and highlights also multiple bilateral pulmonary hilar and mediastinal lymphadenopathy. Liver, other intraabdominal organs, digestive tract and bones are devoid of hypermetabolic lesions. Both the morphological and metabolic features, as well as the pattern of lymph node spread, are all consistent with stage IIIB NSCLC. The patient subsequently undergoes bronchoscopy and endobronchial ultrasound (EBUS) with transbronchial biopsies of the suspect lymphadenopathies. All biopsies are consistent with metastases of colorectal adenocarcinoma, RAS and RAF wild type. PD-L1 staining was negative on both tumor cells and tumor-infiltrating cells. Standard palliative chemotherapy was initiated, using the FOLFIRI regimen in combination with the anti-EGFR monoclonal antibody cetuximab. According to the latest 2014 WHO World Cancer Report, colorectal cancer represents almost 10% of the global cancer incidence burden, and is the third most common cancer in men (an estimated 746’000 cases in 2012) and the second most common in women (614’000 cases in 2012), leading to 694’00 estimated deaths worldwide annually . The five-year survival rate for all stages of CRC is 65% according the Surveillance, Epidemiology and End Results database, while it reaches 93% for stage stage I . In node positive (stage III) disease, adjuvant chemotherapy reduces the risk of death by 30%, which is equivalent to an additional 10-15% survival gain . Our patient did not undergo adjuvant chemotherapy, as it was not an accepted standard in the late 1980s. Elevated CEA levels after surgical resection indicate recurrence with a high probability, while a normal postoperative CEA level is not useful for excluding disease recurrence. In colorectal cancer, lungs, regional lymph nodes, liver and the peritoneum are the most frequent sites of metastatic spread, which usually occur within two years after curative resection of the primary cancer . Pulmonary metastases of CRC usually present as multiple lesions in both lungs consistent with hematogenous spread and they are typically located in the lung periphery. 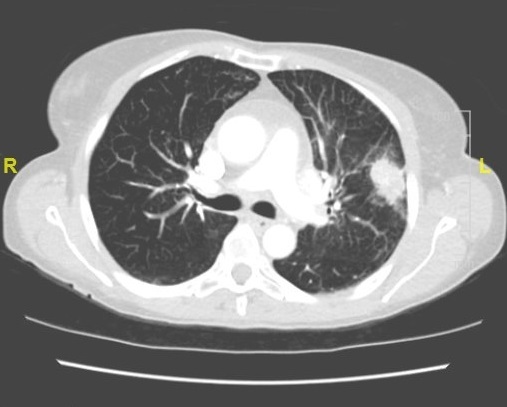 However, approximately 10% of pulmonary metastases present as solitary pulmonary lesion . 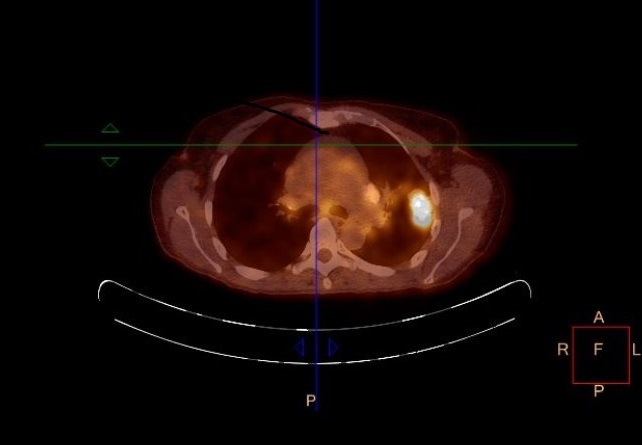 Furthermore in a patient with a history of extrathoracic malignancy, the probability of metastasis increases significantly when a pulmonary lesion is detected on a chest radiograph, a thoracic computed tomography respectively . The reappearance of cancer years after apparently successful treatment of a primary tumor is a well-known phenomenon in oncology [7,8]. Cancer cells may remain quiescent for an extended period of time during which there appears to be a balance between proliferation and cell death due to immunological control or absence of angiogenesis. This concept of “tumor dormancy” is defined as a phase of growth arrest during which disseminated tumor cells exist as isolated cells or micrometastases in a subclinical state during which no evidence of disease is to be found. The underlying mechanisms are manifold, and include cellular dormancy, angiogenic dormancy and immunological dormancy . Cellular dormancy implies either an arrest in the G0-G1 phase or cell senescence acting as a stress-related protection measure in response to cytotoxics, both states that are ultimately reversible. The concept of angiogenic dormancy hinges on the theory that angiogenesis is a necessary phenomenon for micrometastases to be able to grow beyond a certain size. The so-called “angiogenic switch” is the time-point where the balance between pro- and anti-angiogenic factors tilts towards a pro-angiogenic outcome, resulting in the transition from dormant avascularized micrometastases to outgrowing vascularized tumors. A third mechanism is immunologic dormancy where proliferating tumor cells are kept at low subclinical numbers by an active immune system that clears tumors of their immunogenic cells to establish a cell population that exists in equilibrium with immune-mediated clearance. This immunoediting may persist until genomic instability generates less immunogenic profiles , or until direct tumor immunosuppression allows for an escape from dormancy. In the present age of cancer immunotherapy, one mechanism is of direct interest: overexpression of B7 homolog 1 (B7-H1) also known as PD-L1 . The long-term follow-up of the cohorts of patients first exposed to immune checkpoint inhibitors such as ipilimumab hint at a long-term immunological equilibrium even in this advanced high-volume setting, illustrated by a plateauing survival curve . The use of current immunotherapeutics durvalumab, pembrolizumab, and atezolizumab in the early low-volume setting as adjuvant therapy has strong rationale and is being actively investigated in NSCLC (NCT02273375, NCT02572843, NCT02504372, NCT02486718). Tumor Dormancy is a stage in cancer course where the cells cease dividing however survive in a quiescent state while waiting for appropriate environmental conditions to begin proliferation again. This can happen years after primary tumor treatment because residual tumor cells can enter dormancy and evade therapies. The most important mechanisms of tumor dormancy are cellular dormancy (quiescence), angiogenic dormancy, and immunologic dormancy. This case presents a patient with metachronous metastatic relapse of a stage III colorectal cancer mimicking NSCLC more than 20 years after initial therapy, illustrating the capability of tumor dormancy. Negative PD-L1 staining in hints at other mechanisms for late immunological escape. Technological advances for detection of subclinical micrometastatic disease using circulating tumor cells, cell-free circulating tumor DNA or other markers are increasingly performant, and may provide the means for more effective tumor monitoring in the near future, provided they are eventually shown to correlate with patient outcomes. Furthermore, the intensive clinical evaluation of immunotherapy in the time-consuming adjuvant setting may crack the glass ceiling of adjuvant chemotherapy in the not-so-distant future. Stewart B, Wild C (2014) World Cancer Report 2014. Lyon, France: International Agency for Research on Cancer. ©2016 Staudenmann D. This is an open-access article distributed under the terms of the Creative Commons Attribution License, which permits unrestricted use, distribution, and reproduction in any medium, provided the original author and source are credited. Staudenmann D, Gugger M, Dumont Ph, Zimmermann St (2016) Acetogenins of Annona muricata leaves: Characterization and potential anticancer study. Integr Cancer Sci Therap. 3: DOI :10.15761/ICST.1000203. Internal Medicine, University hospital of Fribourg, Chemin des Pensionnats 2, 1708 Fribourg, Switzerland.